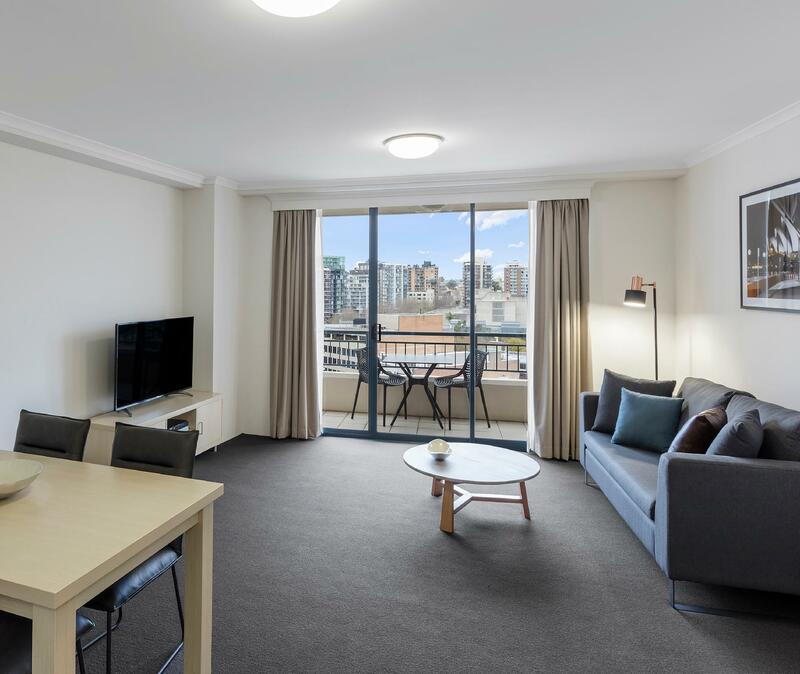 للمسافرين الذين يرغبون أن يعيشو كل ما تقدمه سيدني, Oaks On Castlereagh Sydney Central هو الخيار الأمثل. يجذب هذا الفندق ذو 4.5 نجوم، والذي يبعد 2 km فقط عن وسط المدينة و 15 km عن المطار، الكثير من الزوار سنوياً. يشكل هذا الفندق ملاذاَ مريحاً للاسترخاء ويمنح زواره فرصة للاستجمام والتجدد، وهو يقع على بعد خطوات من المعالم السياحية الكثيرة للمدينة كمثل: مسرح العاصمة, Consulate General of India, Consulate General of the Philippines. 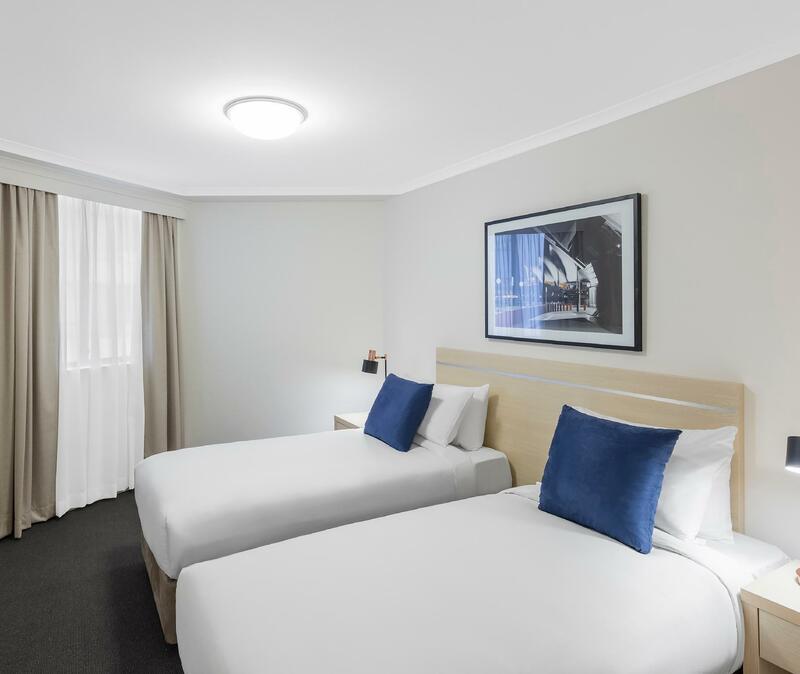 إن حسن الضيافة والخدمات الراقية التي تعرف بها Oaks Hotels & Resorts تغني تجربتك في Oaks On Castlereagh Sydney Central. يمكن الاستمتاع بمجموعة من الخدمات على أعلى المستويات في الفندق كمثل مكتب الاستقبال على مدار الساعة, مرافق مخصصة لذوي الاحتياجات الخاصة, تسجيل وصول/خروج سريع, تخزين الأمتعة, صف السيارات. استمتع بوسائل الراحة الراقية في الغرف أثناء إقامتك هنا. بعض الغرف تتضمن غرفة معيشة منفصلة, تلفزيون بشاشة مسطحة, مكيف هواء, تدفئة, خدمة الإيقاظ لمساعدتك على استعادة طاقتك بعد يوم طويل. كما أن مجموعة الخدمات الواسعة الموجودة في الفندق لضمان راحتك تترك لك الكثير من الخيارات لقضاء وقتك أثناء فترة إقامتك. إن كنت تتطلع إلى إقامة مريحة وهادئة في سيدني، فستجد في Oaks On Castlereagh Sydney Central بيتك الثاني. يرجى العلم أن رسوم انتظار السيارات غير مشمول في سعر الغرفة، ورسومه هي 35 AUD في اليوم. يرجى إشعار الفندق قبل الوصول مباشرةً؛ ليتمكن من حجز مكان لك، إذ أن توافر الأماكن محدود. يرجى العلم أن مدفوعات بطاقة الائتمان/المدينة التي تتم مباشرة لفنادق ومنتجعات أوكس، سيُفرض عليها رسوم معاملات بطاقات ائتمانية بنسبة 5.1%. Perfect everything was absolutely fantastic I appreciate the free upgrade to a room with a view. Modern kitchen clean and spacious room comfortable king bed. Professional staff great customer service on arrival and departure. Housekeepers very friendly. No cafe or restaurant attached to hotel however the cafe a few steps away from hotel I had breakfast daily on my stay and it was very good plate presentation and coffee made to a high standard. No negatives for this hotel I will be returning. Hotel is 400 m to Central station, Lite Rail and Museum station, 15/20 min walk to Circular key. Coles and W/worths nearby if you want your own food (the latter near Central station, Coles near China Town which also is about 500 m. Spa and pool open all year and spa is heated. Staff very accommodating - actually went out of their way to help. Accommodation was good (we were on 27th floor) with good views - ours looked towards Central station. Changed towels daily. Quiet room. If you are a senior, go immediately to Central station and obtain the concessional Opal card - on producing interstate seniors card. This allows you UNLIMITED travel (train,bus and ferry) for $2.50 per day (each card holder). We trav all day on ferry, buses and train to Newcastle and Blue Mountains. Recommend train to Bondi jtn t 380 bus to beach then 380 bus to Watsons Bay where you catch ferry or 324 Kings Cross. Stayed in around 6 Sydney hotels at different this is the only one would go back to again. Check in was a nightmare, we came by our own car and not knowing, when we arrived there was no where to park the car. You had to park away from building walk back to check in then walk back to car and get your bags or drive around the block to get into car park. the girls where nice but not good in english....isnt this Australia!! The room was ok but old it needed some attention, taps fell off in the shower so now I am the handiman. some comfortable chairs to sit in would have been nice within the room. The pool needs a reno. At the end of the day it was dry cool and quite, so if you are looking for cheap accomodation this is the place. The service apartment is about 10 minutes walk to Chinatown. Plenty of Thai eateries at the surrounding. Other than the limited access to Wifi which I know even before I booked the apartment, the stay has been a pleasant one. Managed to secure a car park at $40 per day. The staff has been helpful. Just that if we were able to get a higher floor, it will be even better given the train noise at night time can be quite irritating. This room was very good but if you're looking for character this is not it. It's a functional room which is basic. The kitchen and has what you need and the bathroom too. The location is perfect, a stones throw from a mainline train and busy roads full of taxi's nearby. I had a 1br apartment for 2 nights. It was HUGE!! I loved the balcony with views towards the capital theatre in front of me and central to my left. Also, The windows could open!! Fresh air. Having the balcony door open too was a bonus. The aircon worked well both on cool and heat. Will be back again. Close to transport, amaizing restaurants, cinemas, cafes, shop... everything you need is right there. Very spacious and has complete kitchen equipment. 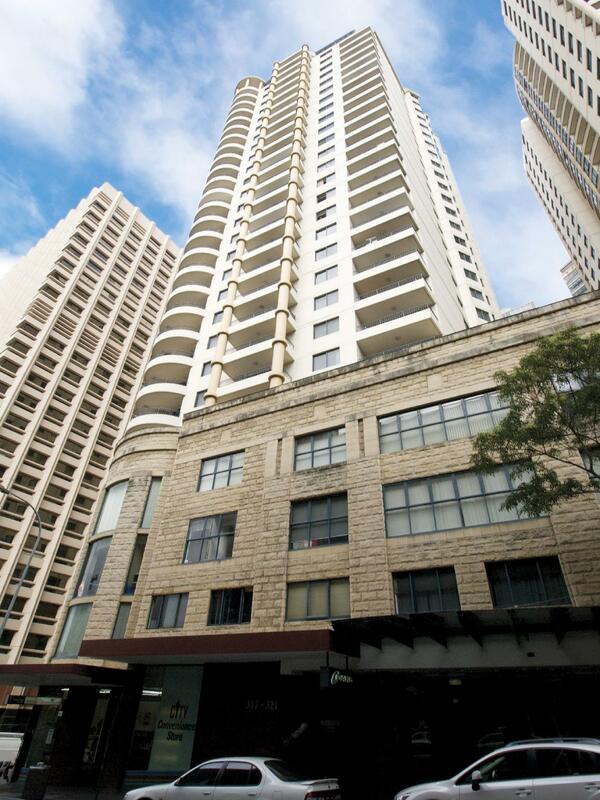 Oaks in Castlereagh lies at the heart of Sydney Central Business District. Very accessible to nearby establishments like restaurants, supermarket and many others. The staffs are very friendly and efficient! Very nice view and good location Big rooms but quite noisy, able to hear noise from corridor and doors Very disappointed to the bathroom that taps are old and rusted, sliding door of bath tub can't open and close properly, the most problem is there's a broken tile right in the middle of the bath tub was not replaced! Also, when the staff come to check it up, he just knocked the door and open himself by their key directly instead of waiting for me to open! Isn't it too impolite? How can you sure that I am ready to open?! The hotel was very basic but was a good size and had a very convenient location. It is a 2 minute walk to Central train station and an affordable place to stay In the city. The staff were helpful and friendly. Great stay, good location and perfect price! We were met with friendly staff and the hotel room was standard studio. It’s basic, clean and exactly what we were looking for. However we didn’t realise the kitchenette was hidden in a cupboard as the kettle was sitting in the wardrobe and couldn’t find any coffee mugs or wine glasses at first. I asked reception if he could bring some up and they never came. We eventually found the kitchenette but I wish the staff member had told us about it (Some studios don’t have a kitchenette) or maybe we were just a little blind at first. Overall we had a great stay and I would definitely come back. Like the location and good price. We got the penthouse room so the view is nice! But overall, I think the room is not clean enough. Housekeeping did not clean the dishes and glasses for us while other service apartments did. Also, they didn't clean our bathroom well. Travelled with colleague on business and decided to get a 2 bedroom apartment. We were pleasantly surprised with how spacious the living areas were (full kitchen, bathroom, lounge and dining)and the facilities associated with the rooms. The bedrooms were also of a decent size with one having an ensuite which meant that we both had our own bathroom so personal privacy was great. Location was also great for us as it was close to the offices we were visiting in Goulbourn St, and there were plenty of pubs and restaurants close by. Security was also great with front doors of hotel requiring your room swipe card for access after 6 pm as did the lifts. Rooms were also free from noise from surrounding rooms.Overall a great stay and I would highly recommend this hotel. The location is good for business visitors, there are numerous pubs and restaurants close by for eating, and the staff were friendly. The studio room had plenty of space and it had a compact functional bathroom. The facilities were very good with a spacious wardrobe with iron and ironing board, toaster and kettle. 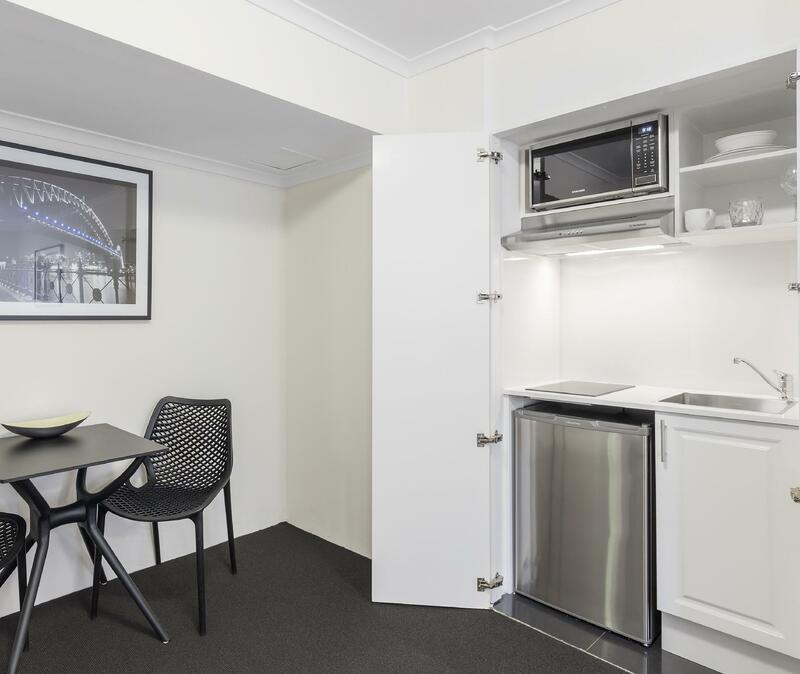 There was also a compact cupboard which had a bar fridge, microwave, 2 hotplates and all the crockery and cutlery you need. The only negative I had about the room is that when the air conditioning was on it was quite noisy, but otherwise the room was great.